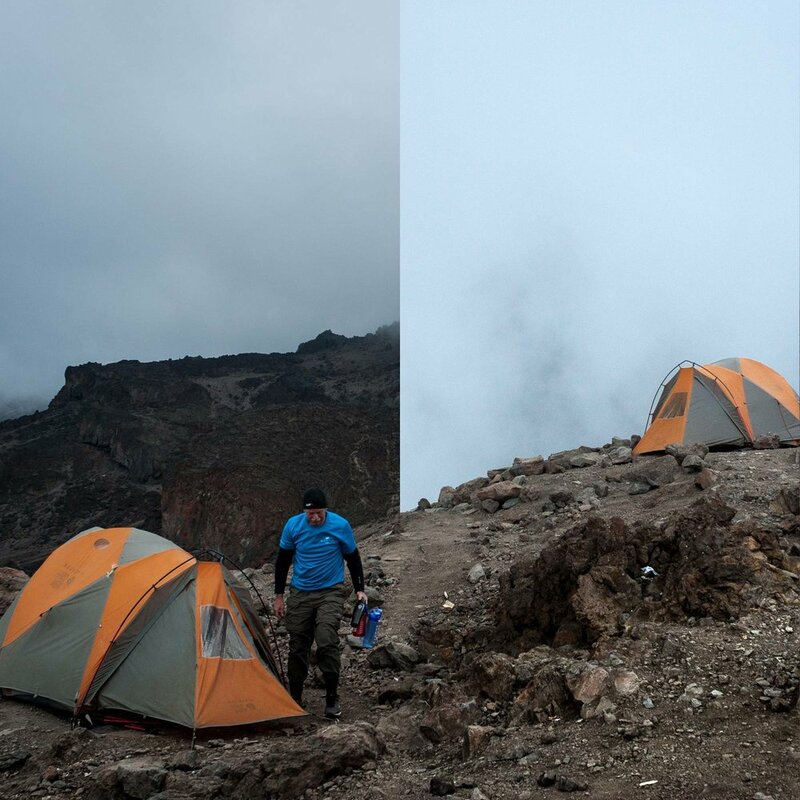 Dawn broke at Karanga Camp casting light first upon the summit cone that towered above us. I packed up extra quickly to allow myself more time to explore the camp with my camera. This was the closest to Kibo that we’ve been. I enjoyed watching how the light changes over time on the peak, slowly revealing it’s various contours and textures. At this range, we could see stunning detail. I found it hard to take my eyes off of Kibo. Some people speak of conquering mountains when they summit, but for me it doesn’t seem appropriate. You can train and prepare all you want, but the mountain ultimately makes the decision: Sometimes the mountain (and its weather) are in a good mood and tolerate your presence. Other times she is not in the mood for visitors. It was looking more and more like Kibo might be ready for some company. 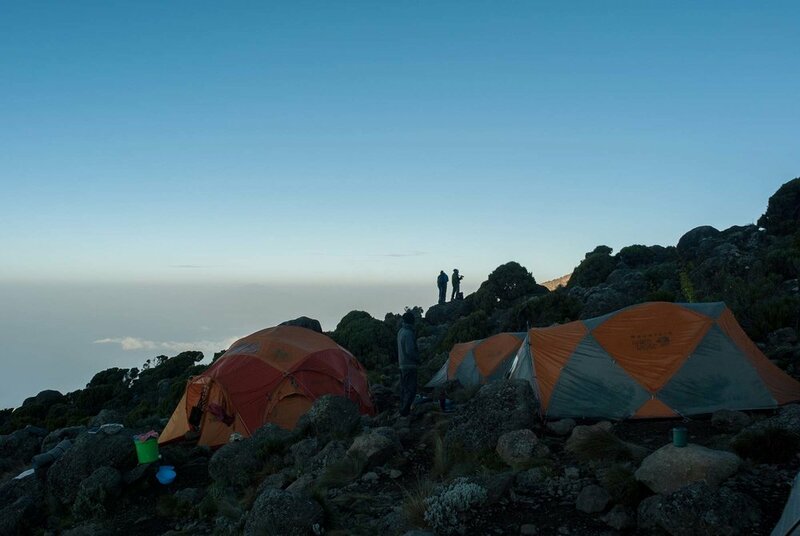 Climbers in Karanga camp getting ready to grab that perfect morning shot of Kilimanjaro's summit cone. The whole team was looking good at breakfast. Heidi was beginning to look human again. She was able to eat a pretty decent breakfast and even managed to crack a smile from time to time. It was a beautiful, warm, sunny morning. You could just tell there was a good vibe. We must be getting close to Summit Day. The day's itinerary was manageable: Just a short hike to Base Camp; then we eat lunch; sleep, eat dinner; sleep, then at 11:30pm we climb. Good times. This section of the trail was covered in cairns. I don't really know how I feel about it. At this altitude we were firmly in the Alpine Desert ecological zone. At this altitude there is nothing but rock. Maybe some lichen, but there is no water source for the critters—including us. 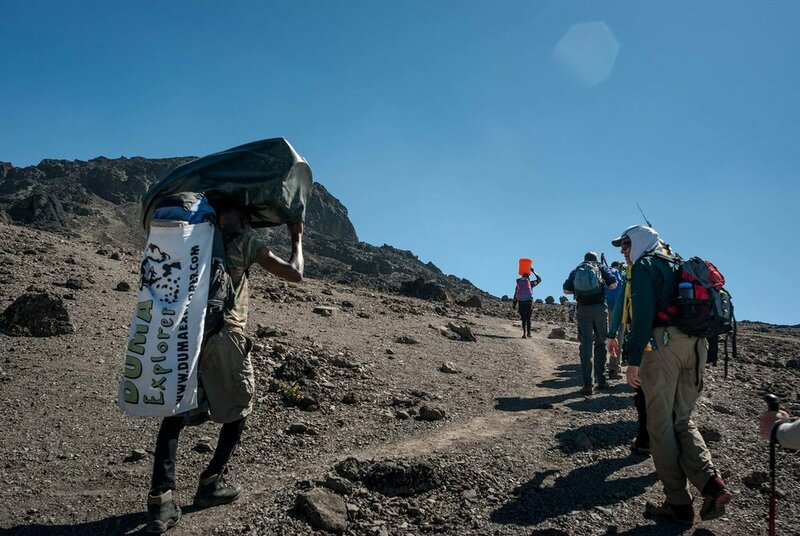 In fact, to supply our camp with water, the porters carried water from Karanga to Barufu the night before in 5 gallon plastic containers and stored them at the ranger hut until our party arrived to set up camp. Our porters passed us pretty early today, by this point the staff was getting to know us and there were smiles and high fives. Dickson, our waiter also carries the camp flag on his pack. Our entire group of climbers really liked our staff. Seeing this flag go by filled us with a lot of pride. Looking through these photos and writing about them really makes me miss the entire staff. Btw, Duma Explorer was our tour outfit. 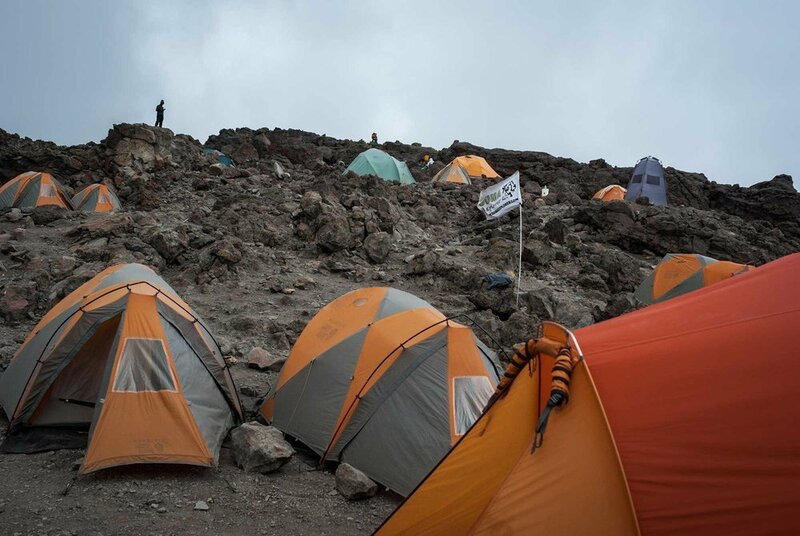 Check them out if you're thinking about climbing Kili. Not long into the hike to Barufu Camp, Heidi who was on the mend but still severely handicapped from her illness, began to tire out. Her pace slowed and we fell behind the rest of our group. I stuck with Heidi but began to think again about our agreement to split up if one person couldn’t summit. 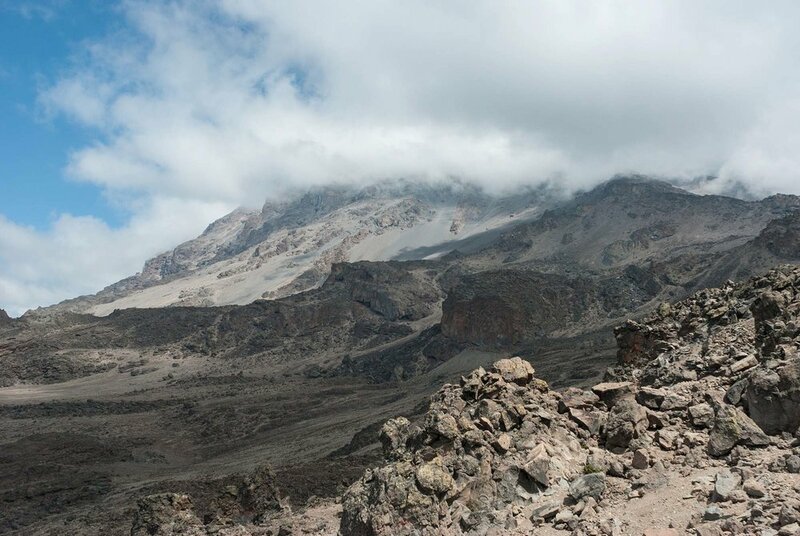 Kili was always her dream, so it didn’t seem right to ditch her and bag the peak for myself. I made up my mind that I wouldn’t leave her no matter how close we got. Either we both were going to summit, or we were both going to have to come back to summit some other time. Spirits were high as we pulled out of camp. Confident that I was on the mend, I raced ahead to take this photo so I could have a few photos of our group from the front. Running uphill at 14,000 feet isn’t all that much faster than walking, and I had to ask them to hold still so I could get the shot. Somewhere below the clouds in the background is the town of Moshi. As we approached ridge below Barufu camp, we could see climbers and porters descending the ridge as it continued below the camp. (Squint at the top of the ridge, you'll see them!) They were headed home. They had either summited or had given it their very best effort. Soon it would be our turn, and the excitement was building by the minute. Four of the five guides discussing the status of the climbers while they sweep up the stragglers — Heidi and myself. You can clearly see the trail leading back toward Karanga camp, hidden by the ridge on the horizon. The slow crawl of porters and climbers would continue along the path for several more hours. By my estimates there were thousands of people on the mountain at any given point. 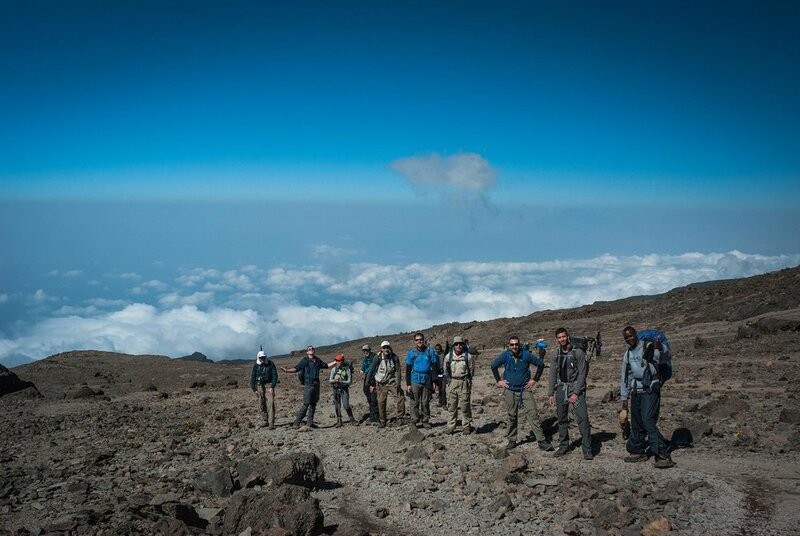 All of them united in the same goal: To stand in the highest point in Africa. Today, even the guides looked exhausted by the thin air. But they never complained or made mention of it. Despite having a functional looking hip belts on their ruck sacks most never seemed to use them. Their packs were obviously quite heavy. I never was able to get a straight answer as to whether it was due to bags being in disrepair or if it offered some benefit. My shoulders and back hurt just looking at those loads! At this point, the team has walked 180° around the Southern side of the mountain. Barufu Camp is situated on a ridge with hardly any flat ground at all. It is barren, and bleak. The air is thin, but the excitement is frenetic. The climb from the valley floor to the top of the ridge on which Barufu camp sat was grueling. At 15,287 feet, everything required more effort and thought. Going downhill wasn’t too bad, but anything with a slight incline really slowed me down. Heidi had toughed it out to the top of the ridge but was definitely showing signs of serious fatigue. I went ahead to the ranger hut to sign us in, and she went to our tent to crash. In a little under 12 hours we would be gearing up for the summit push and it was critical she focus on resting and eating, but it wasn’t looking good for her. Me on the other hand, I felt great! Ok, that’s a lie. I was definitely doing a lot better, but I was definitely anxious about the next stage of the trip. 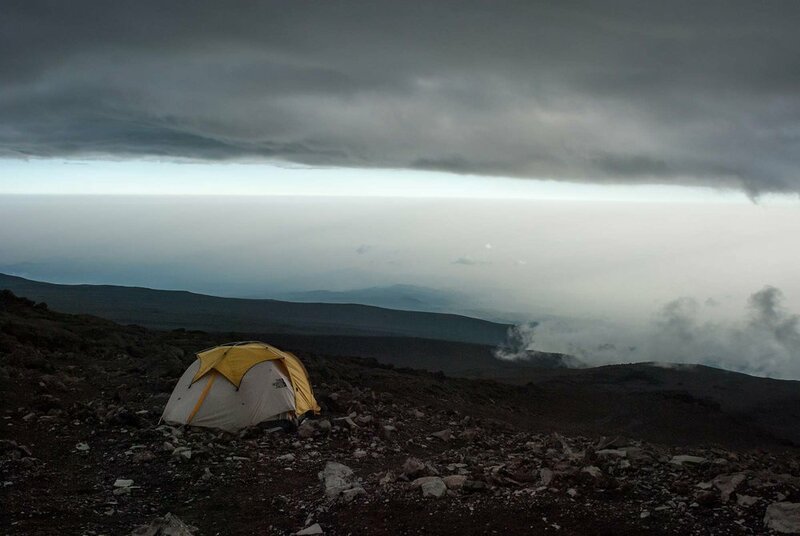 If you don’t like the weather on Kilimanjaro… Just wait a few minutes. Above are two photos taken about three minutes apart. In that time the cloud bank on the right rolled in from the valley below and completely blanketed the entire mountain. It felt like the edge of the ridge was the edge of the world. Even though I desperately needed to rest for the summit push, I couldn’t stop exploring the camp — there were too many interesting things (like this) to see. Room with a view. 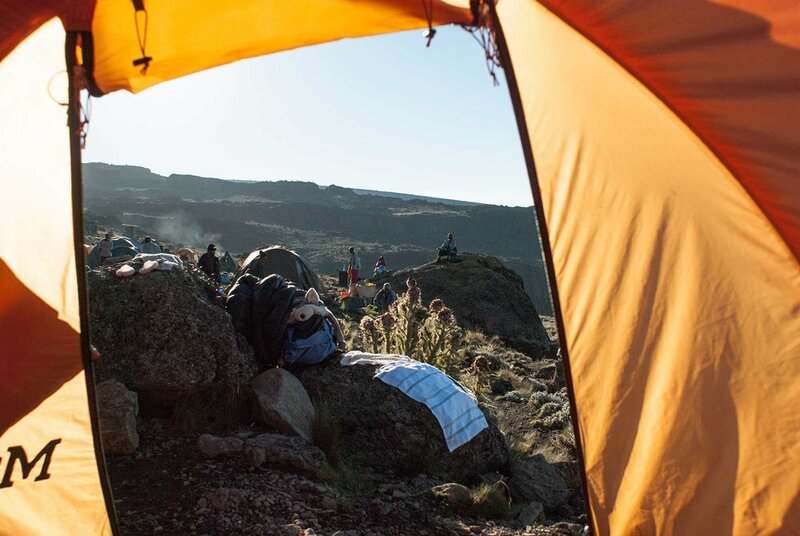 Three guides pitched their tent on some sweet realestate on the Eastern slope of Barufu Camp. 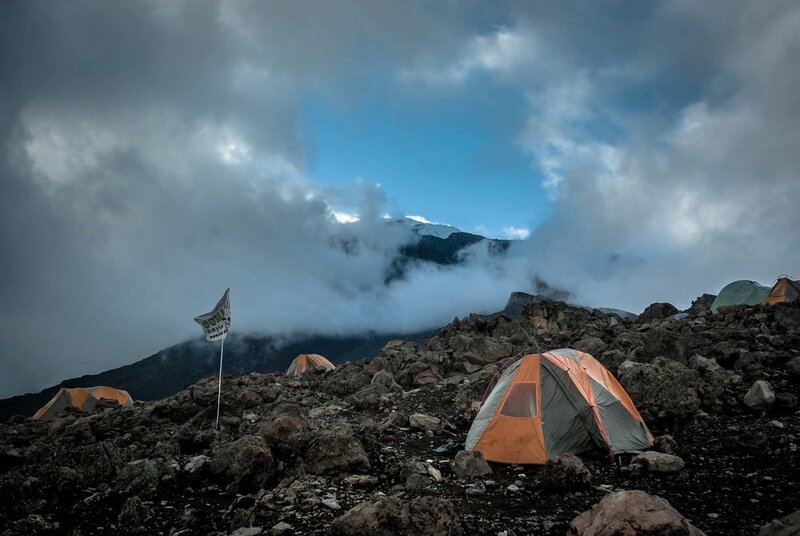 Duma Explorer flag whipping in the winds as the Sun sets over Barufu Camp, Kilimanjaro. 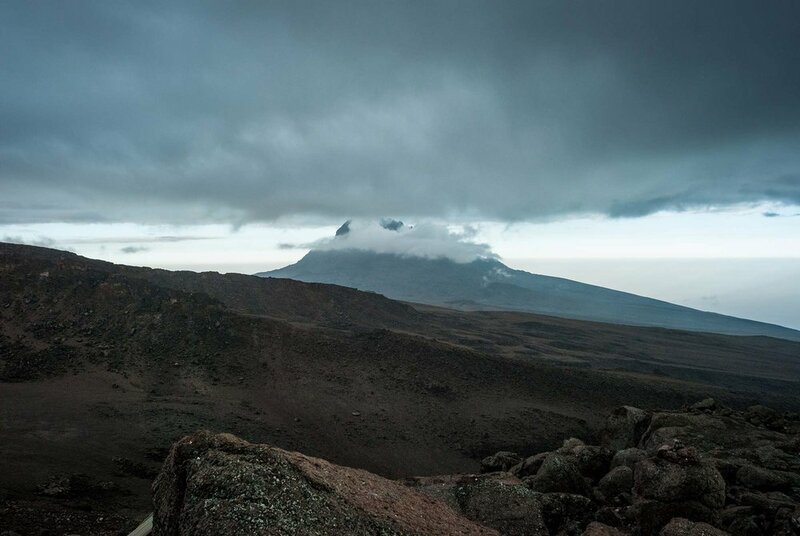 Mawenzi could be seen lurking in the distance. Before dinner, Emmanuel stopped me to discuss Heidi’s condition. She barely made it into camp today and I was very concerned that she wouldn’t have the energy to hike again in 4 hours. Emmanuel informed me the guides were planning to carry her pack. 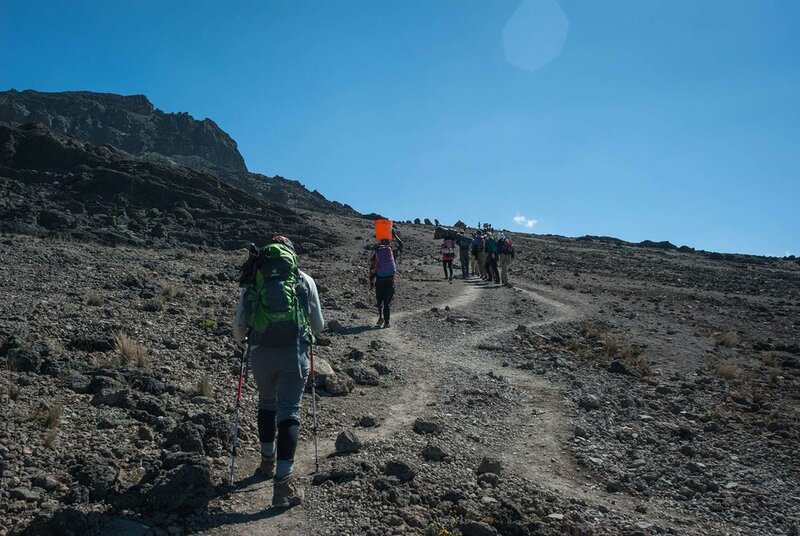 Normally she and I would have protested and I would have strapped her pack to mine like I did on the Barranco Wall. However, I was already concerned enough about my own chances that I decided to let this one go. When the guides informed her of the plan, she immediately agreed, which is extremely uncharacteristic of her personality. I knew she was still feeling really crappy to give in that easily. Sizable dinner in the belly, I took one last look at Kibo before the light faded completely. It was time for a three hour nap. For six days I stared up at the mountain’s summit as we approached and then circled it. Now we stood at the summit cone’s very base. 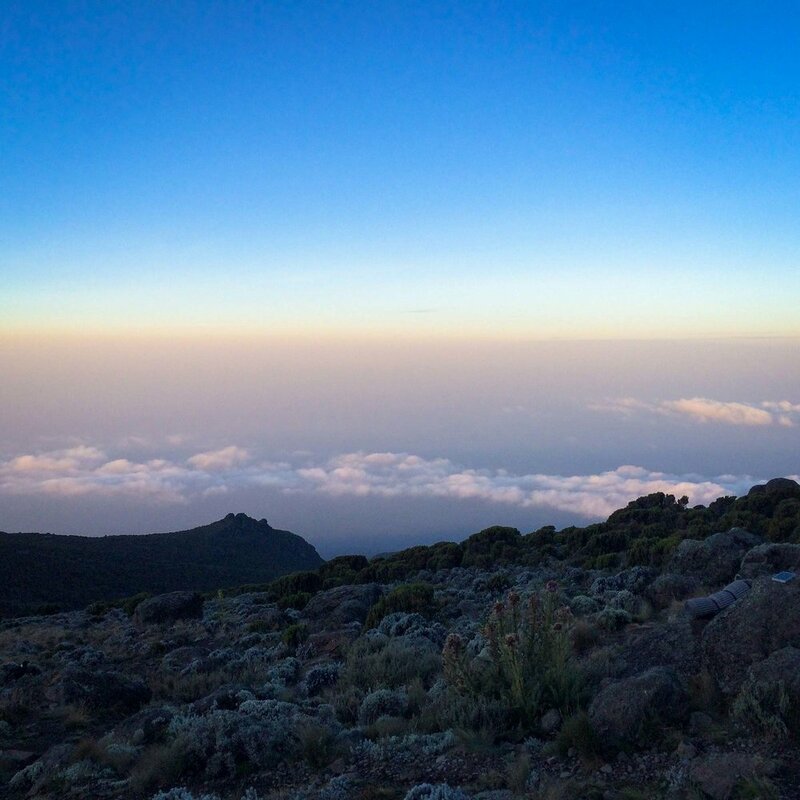 In a matter of hours we would gear up to begin the summit push in the dark, hike through the night and arrive on the summit as the sun is rising over Mawenzi, the youngest of Kili's peaks. It occurred to me then that the next time I was going to see the Kibo, it would be entirely beneath my feet. How is anyone able to sleep with thoughts like that going through their brain? 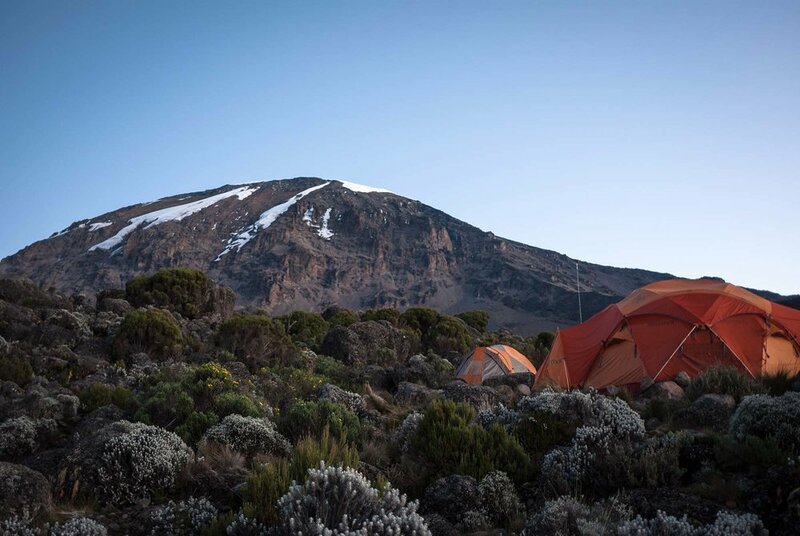 Welcome to the sixth day of our eight-day Kilimanjaro climb. If you’re just tuning in, you may want to start at the beginning of the adventure.